Kolesnik Dmitry is editor of a left-wing Ukrainian website. The following inteview was published at Counterfire on March 26, 2014 and first appeared on the In Defence of Marxism website. Links International Journal of Socialist Renewal has published a range of views from the left on developments in Ukraine and Crimea HERE. Can you introduce yourself and the website? Yes, please. Kolesnik Dmitry – co-editor of Ukrainian left site Liva.com.ua. It’s one of the largest Ukrainan leftwing resources. We have been working for more than three years and focused mainly on such issues as modern left theory, international union and anti-fascist struggle, issues of economy and culture as well. We translated many modern Marxist thinkers. We have a wide range of writers all over Ukraine and Russia as well. Although, the last months we focus mainly on Ukrainian events and we have quite substantial reasons for that as our country appeared recently at the hub of political and economic turmoil. So, here I’ll also focus mostly on the internal impact of the current Ukrainian crisis rather than on the international dimension or the issues of the West-Russia tug of war. What is your general appraisal of the character of the Euromaidan movement? What role did the extreme nationalists and fascists play in it? The Euromaidan movement started when the then government declined to sign the free-trade agreement with the European Uunion because it was attached to International Monetary Fund demands to impose austerity measures and raise prices (as the government quite reasonably was afraid of the potential social unrest it would cause). Euromaidan gained a support of some layers of society after the dispersal of protesters. In general rightwing and reactionary forces dominated there from the very beginning. Moreover, it was supported by Western-backed NGOs that tried to provide a necessary cover for the media. We should also not ignore the role of the media of some oligarchs that promoted the movement which gave attention to the real anger directed against the corrupt regime of the government. As for politicians and big businessmen that backed the Euromaidan movement -- they were mostly those of the so-called "Orange" clan formed in the process of the “Orange revolution" but later ousted from power. Extreme nationalists and fascists played actually the role of the core that attracted ordinary people, therefore the far-right could impose its agenda on the whole movement as other groups (pro-democracy or liberal) were not so significant and served mainly as a cover helping to whitewash the image of the protests in the media. While liberal groups provided the needed "look" in coverage, the ultra-rights organised and formed their own structure. I would rather admit that without extreme nationalists and Nazi paramilitaries the whole Euromaidan movement still could be a peaceful camp of protesters ignored by the authorities. And a large part of the peaceful protesters understands this quite well; therefore, many legitimise and tolerate Nazis. Insofar as extreme nationalists were the most organised coalition – determined to fight and gain victory by any means possible – they have effectively succeeded in attracting popularity in the mass of protesters and we see as a result the general rise of far-right sentiments in society. Thus, we see that even a certain part of progressive groups or individuals were influenced by a right-wing agenda – either nationalist or neoliberal. We can compare the movement partly to the opposition in Venezuela, to the "pro-democracy' and nationalist movements in Eastern Europe in 1989-91 or to the viral nationalism in ex-Yugoslavia in 1990’s. But what’s new is a common rise of more radical far-right movements all over Europe and I think we should consider the movement in this context too. And another aspect that has also contributed to the rise of the far right is the fact that the ex-government for too long exploited official 'ant-fascist" positions. As far as it was really rather corrupt, such a position discredited anti-fascism, pushing sentiments to the opposite stance – to the far right. Mainstream media try to ignore it or dismiss the phenomena as mere propaganda from Putin, therefore taking into account only the geopolitical issues of superpowers and almost completely ignoring the impact of the current crisis inside Ukraine. Actually it’s the worst tactics – to ignore the rise of the far-right just because Putin talks about it. If he would say, for example, that Greece is hit by austerity measures, it doesn’t mean that in reality it is quite the opposite. So, the Western media are caught in a trap. Meanwhile, Ukraine falls apart, Russian nationalism rises in response, Putin gets Crimea and the media try to ignore those who have mostly contributed to it – our far-right radicals. 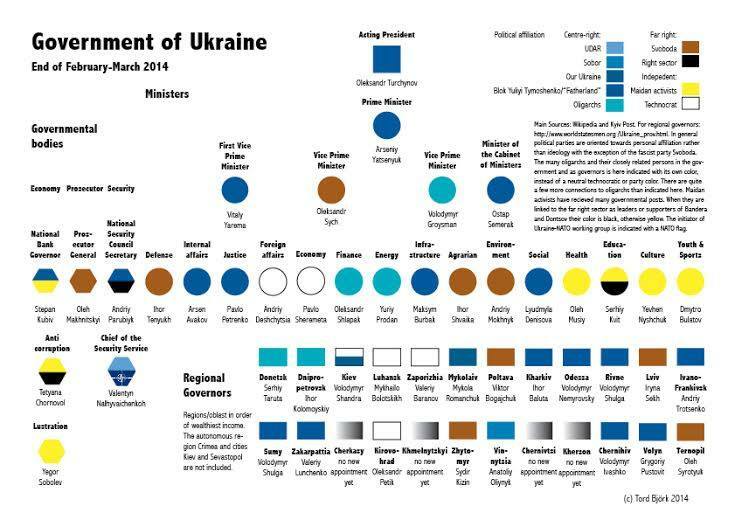 What is the character of the new authorities in Kiev and what interests do they represent? The current government is mostly a coalition of moderate rightwing neoliberals and open far-righters. Such a coalition of far-right paramilitaries and neoliberals is mutually beneficial, despite some current tensions between its factions. The new government willingly adopts new IMF loans with austerity measures attached and tries to justify these means by an emergency, while extreme rights should either violently suppress all the indignation and anger or channel it into a war with dissenters, foreign threat, "traitors", leftwingers or other kinds of enemies that could be easily found in the process of a "witch-hunt". Inside the country the current government represents mainly the interests of those oligarchs who supported the Euromaidan movement (though some of them supported it from the ex-ruling party). Some of them were recently appointed as governors while others get large benefits from the public-budget or try to take over the businesses of other oligarchs. Sometimes they use for this purpose far-right paramilitaries. In general the current government rather well understands that it will not last long and, therefore, tries to adopt the most unpopular decisions and take the maximum benefits as soon as possible. In fact we had no choice: either the old corrupt regime or the equally corrupt new regime with an extreme rightwing ideology; either a brutal corrupt policeman or a brutal corrupt policeman enlisted from a Nazi-paramilitary unit. Thus, every step of the new authorities provokes more indignation not only among its opposition but also among its (former) supporters. The more indignation – the more patriotic hysteria in media, then the more the desire to secede rises in different regions and that leads to further brutality from rightwing paramilitaries. So, it goes in such a vicious circle with every turn provoking more harm and pain to the wounded country. What is the reaction of ordinary people towards the new authorities? Have there been any protests against it? Are these limited to the east and south? I’d say that new authorities are rather unpopular even among supporters of Euromaidan, let alone its opponents. The positions of the current government are rather shaky and it can hold onto power essentially due to ultra-patriotic rhetoric permanently mobilising support in the face of foreign or internal threat. Thus, we see an inter-dependence between Putin and the new Ukrainian government – each move of Putin consolidates the shaky Ukrainian government, at the same time each step of this government helps to enforce Putin’s power in Russia. Thus, the Ukrainian junta tries simultaneously to suppress anger among the Euromaidan supporters, calling on them to stop criticising the new authorities in such an emergency situation, and suppresses the rebellion in the south-eastern regions of Ukraine labelling all the indignant people there as "traitors" or "spies" and forcing many of them to turn to Russia and adopt Russian nationalism in response. In fact the whole tactics of the new government can be reduced to the simple statement: "Everybody, don’t move! This is a robbery!" South-eastern protests against the new Ukrainian government are not so centralised or consolidated as the Euromaidan movement as far as they are held not in one place but dispersed over many cities and towns of south-eastern Ukraine. In fact we see there the intersection of different aspects at once: so-called "regional patriotism" (as people feel abused by the fact of violation of their will); attempts of local elites to preserve their own power or wealth and in doing so cause offence to their rivals from another clan; we see Russian nationalism as many people look at Russia as a kind of saviour just like many people in the Euromaidan movement see a saviour in the EU. Moreover, there’s the workers’ anger too as large industries are mostly concentrated in the south-east and the more cosmopolitan workers are a bit alien to the conservative nationalist agenda promoted by the new government (and we should not ignore that industry workers will be potentially more affected by economic globalisation and free-trade); there are also "pro-Soviet" sentiments of large parts of the population in south-eastern Ukraine. At the same time there are strong anti-fascist sentiments present there as a reaction to the activity of far-right gangs, especially Right Sector. It’s not accidental that the first "victims" of the far-right wing of the Euromaidan movement were monuments to Lenin or to Soviet soldiers of WWII. The counter-rebellion in south-eastern cities started also when people tried to defend those monuments. We shouldn’t forget that WWII was in fact a civil war in Ukraine and that the old line of division between Nazi-collaborators and pro-Soviet fighters has been skillfully exploited for the last 23 years by both ruling clans. The ghosts of history are revived to be used mostly in the course of competition for business and power. Society is really divided and almost into halves. As for protest activity, in south-eastern regions it is united mainly by aversion to the new government and its policy while in other parts of Ukraine the protests mostly take the shape of in-fighting between different Euromaidan supporters. There are some far-right units that fight with one another for the control over a town or an enterprise. There are a lot of those who are dissatisfied by the new government. However, protest actions of other forces (opposed to Euromaidan) are almost impossible in western regions as they will be immediately attacked by far-right paramilitaries. What is the role of the more extreme right-wing organisations like Right Sector and Svoboda in the new government, in the security forces, in the streets? And what is their relationship with the more "mainstream" capitalist parties? As you can see (infographic above) far-right forces control mainly defence and law enforcement agencies, prosecution, education, anti-corruption, environment, agrarian ministries as well. In general they got a lot of power. The biggest problem is that even moderate right-wing parts of the government cannot really control them. The new government cannot rely on the old army and police staff and, therefore, they are "hostages" of the far-right paramilitaries. Recently far-right activists were incorporated into police and state security services on most positions. The military units were attached to "far-right commissars" to guarantee the loyalty of officers. There was also a "National guard" formed and mostly the Right Sector and "Euromaidan Guard" were recruited there. But nevertheless there are many far-right gangs that still do not subordinate to anybody. 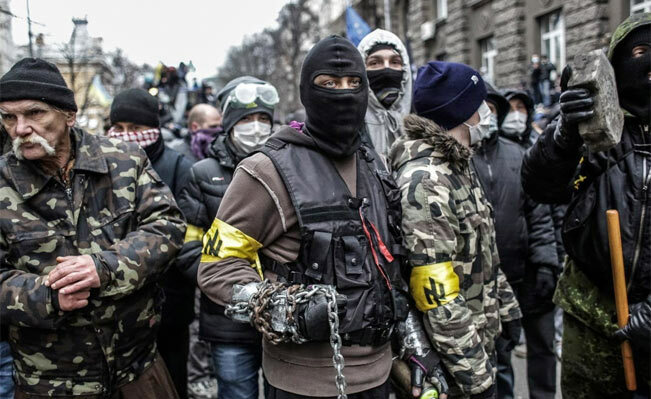 There are some tensions between Right Sector and Svoboda that sometimes spill over into open fighting. Pro-capitalist parties try to use their energy and channel it into suppression of dissenters or the south-eastern rebellion. At the same time far-right parties accuse mainstream parties of betrayal and demand war with Russia or with Crimea. Other groups of far-right paramilitaries tend to become a kind of racketeer gang imposing their own tax on local businesses or take part in raiding clashes between business-competitors. The situation is being polarised along national lines -- what position have left-wing organisations taken or should take in your opinion? Where to turn? What to demand? This situation naturally shifts the leadership to the most reactionary Ukrainian cliques who express their "nationalism' by seeking to sell the Ukrainian people to one imperialism or another in return for a promise of fictitious independence. And we have seen it quite clearly that different governments just changed their rhetoric and went on plundering the country either themselves or profitably selling it to one or another foreign power. So, first of all we should look beyond this national line of division and focus on economic issues. We need to draw another line crossing the ethnic/national one – the line of class division that cannot be restricted to Ukraine only but should lead eastwards and westwards overcoming national boundaries – uniting workers of different countries against their real oppressor – the bourgeoisie and capital. Moreover, we should bring back the ignored or forgotten Ukrainian Marxist andl eft tradition because the rightwingers have effectively "hijacked" the very ethnic identity of a Ukrainian, associating the right-wing position as being "purely" Ukrainian and denying left or Marxist positions as integrally alien to a Ukrainian – as "brought by foreigners", despite the fact that it is deeply rooted in Ukrainian culture as well. In the current situation, the left forces cannot (mostly due to small numbers) take over the initiative in either Euromaidan or in the counter-rebellion in south-eastern regions. However, they can carry on agitation – more freely in the south-east and in the underground in regions fully controlled by the new government and far-right paramilitaries. What would be the consequences of the economic agreement with the EU from the point of view of the working class and the people of Ukraine? We can see what the results are of this agreement in other countries that earlier signed it (Albania, Algeria, Egypt, Jordan, Lebanon, Serbia, Tunisia and others). We can also see the effects of the NAFTA agreement on Mexico. In short, removing economic tariffs makes the majority of Ukrainian industry non-competitive and, therefore, can lead to mass unemployment. On the other hand, Ukraine will be a new market opened for EU goods and many small entrepreneurs hope to make profits from the removal of extra taxes on imports. That’s also one of the reasons why so many small and middle entrepreneurs supported Euromaidan. But additionally we’ll get IMF demands attached to the agreement – particularly austerity measures, gas-price rises, freezing of salaries and so on. The agreement also assumes the enforcement of "war on piracy", copyright laws and general strengthening of standards of goods that have to be met. Thus, we’ll see the essentially uneven rules of a game for EU and Ukrainian producers. Actually we see the results of such economic policy in other countries that were earlier pulled into the global market. What has been the position of the workers and workers' organisations in these developments? Are there any indications of independent working-class activity? Where do you think this can come from? The large official unions are mostly under the influence of one or another mainstream capitalist party, they mostly serve the interests of a respective clan of oligarchs. In December-February there were numerous attempts of Euromaidan forces to organise a general strike for an hour, however all the attempts failed (pre-emptive strikes were mostly supported by small entrepreneurs in markets) as no social demands (put forward in the interests of workers) were included. But there are some new recurring flashes of workers’ struggle in both parts of the country as workers demand salaries or confront layoff prospects. However, we are in such a situation now when all kinds of workers' struggle (directed against the neoliberal policy of the government) can be easily dismissed as "pro-Russian" provocations. As I said the new government tries to ban all kinds of "uncomfortable" activity demanding "not to rock the boat" in an emergency situation. If the new government will preserve its power (though its positions are rather shaky) we’ll see the implementation of tough neoliberal economic reforms that can lead to a new wave of protests. In this context a rather promising example comes from the recent wave of unrest in divided Bosnia. We’ll most likely see similar flashes of unrest in Ukraine, but with the absence of really independent unions (i.e. not just tools of rival capitalist parties and bosses) or with the absence of an organised political workers’ structure. Such spontaneous flashes of workers’ unrest can either pass in vain or (much worse) be brutally suppressed by far-right paramilitaries as has too often happened in Latin American countries. So, I think we must work aiming at future social unrest so that to have a strong and developed structure already prepared when it starts. What is the current situation of left-wing activists and organisations in Ukraine, from the point of view of their security and general activities? Insofar as the Euromaidan movement and the new government have dominated anti-communist sentiments, the activity of left-wing organisation s is mostly under permanent threat. Ukrainian left organisations are too small and activists dispersed over many cities and organisations. Left or communist symbols were in fact banned in most areas. The offices of some left-wing organisations were looted and many activists beaten or tortured by Nazi thugs. There were some left-liberal organisations (mostly those that were associated with Western NGO activity) that tried to support or take part in the Euromaidan movement but without left symbolism or red flags. There are also some groups like Borotba that take part in south-eastern counter-rebellions and anti-fascist resistance that is spreading over some cities. In general we see that amid increased patriotic hysteria (of the new government and pro-Russian forces as well) there is a trend (similar to the pre-WWI situation) for some activists to buy into patriotic propaganda and decide to back one or another capitalist camp and, therefore, in fact to put aside issues of internationalism and class struggle. Unless we overcome this tendency, we’ll end as an incorporated part or an "auxiliary unit" of one or another capitalist force. What do you think will happen next? War with Russia? What is the position that the left should take in Ukraine, in Russia and internationally. Despite all the war-mongering I think (or rather hope) that there will not be another imperialist war when workers of different countries willingly kill each other for profit maximisation. However, I think that most likely we’ll see the coordinated plundering of Ukraine by both sides (the West and Russia). The left should in such a context confront the interference of its own country in the crisis. We should understand that we deal with one and the same enemy despite all the masks it wears. The enemy is within – whether in Russia, Ukraine or Western countries. Moreover, we should understand that in times of crisis fascism becomes the last straw of capital as it puts aside the "democracy" rhetoric and tends to apply an open terror so as to suppress anger. And we witness the rise of far-right forces all over Europe and ex-Soviet republics. We can even talk of the establishment of a "Brown International". So, Ukrainian far-rights in power and on the streets is a part of a common European trend and, therefore, should be dealt also on an international basis. Thus, we should not buy into apparent national divisions of problems or choose "the lesser evil" but start to form international structures able to confront Nazi assaults or the offence of capital on workers -- wherever and whenever it happens to be.